The perfect deck can make your outdoor living space an oasis. Installing it can also represent a significant investment. You can protect that investment by following a few simple deck maintenance strategies. 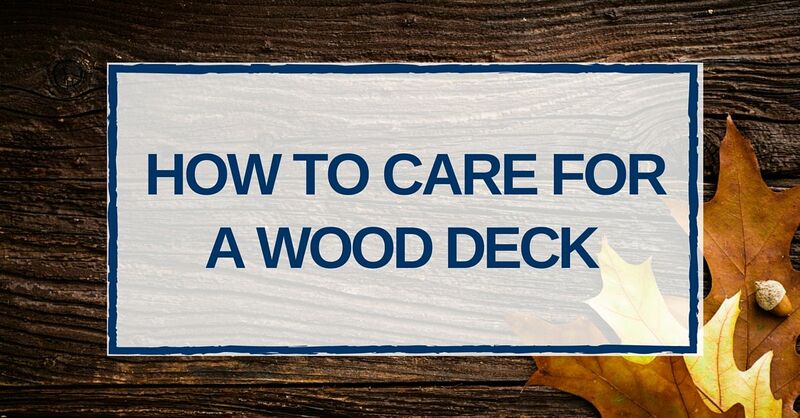 Whether you’ve chosen to have your deck built out of wood or composite materials, here are a few simple steps to follow to keep your deck looking new. Scuffing – Decks take a lot of abuse from foot traffic and furniture. Food Spills – If you barbecue on them, they’re going to collect plenty of spills. Popsicles are going to leak and plates are going to collapse. Debris – Falling leaves can leave stains and clump into corners and become increasingly difficult to remove over time. Weathering – Rainfall and sunlight also contribute to the slow deterioration of your decking materials. As a matter of routine maintenance, clearing debris off your deck regularly will make bigger clean ups easier. Sweeping/Leaf Blower – Run the leaf blower over the deck when you mow your lawn to clear off the debris. Light Scrubbing – If you do much grilling or entertaining you might have to do some scrubbing. Just make sure you use a brush with nylon bristles. A wire brush can gouge the surface. Cleaning Solutions – Most spills can be cleaned with pure water, but others (pine sap, for example) may require something a little stronger. Be sure to use the right cleaner for your deck material to avoid damaging the surface and finish. A power washer can work well to remove debris – but it may also remove finishes and cut into the wood grain on wooden decks. If you are cleaning prior to refinishing your deck, a sander will take a little longer, but the results will be much cleaner and more pristine. Whether the deck is made of wood or composite material, a good sealant will protect it from the elements. When the surface has been properly prepared, the sealant – whether a stain, varnish, or other finish – should keep your deck protected for two or three years. After that time, it may be necessary to sand the surface down of your wood deck, then reapply a sealant. Quality deck maintenance is the key to preserving your investment and the special atmosphere you created when you designed your deck. Whether you use the space to entertain or just enjoy quiet moments for yourself, simple routine maintenance will give your deck a long life and provide you hours of enjoyment.